Looking for a new product for the heavy chewer in your household? 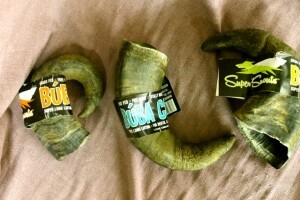 The Buba Chew Water Buffalo Horns, from Super Snouts are a perfect choice! They are also high in protein, very low in fat and help promote teeth and gum health! Another great bonus? They won’t splinter; keeping your dog safe and entertained! The Buba Water Buffalo Horns come from 100% grass fed, free range Water Buffalo in Northern India. The buffalo are free ranging, never branded, with herds being maintained by shepherds who paint different swatches of paint on the horns to tell them apart. Find a Buba Chews Water Buffalo horn at a Northland retailer near you! Learn more about Super Snouts! Looking for more great pet product updates? Be sure to stay connected to us & sign up for our email list!